I love arugula, quinoa AND cherries but how come I never thought to put the three together to make this? I am so making this this weekend. Gorgeous photos by the way! Elegance — this is the word your posts, your space suggest me. I love your pics! They’re adorable: simple, elegant and minimal. A beautiful post. I do not know what i would do without quinoa nowadays. It is a staple in our pantry. This salad looks mighty inviting. Lovely pictures as well. phantastic! So easy and healthy! I want to eat like this every day (so why don´t I??). Wonderful pictures, I love very much the hanging cherries! Cherries make me happy too! Especially when I see them being used in such a great salad. I’m so bored of the ordinary clafoutis/cakes. Cherries shine in savory dishes as well. Your words and your photography amaze me. You have a deft touch when it comes to beauty. I am so glad you’re still sharing. Love the idea of cherries in a wild pile of arugula. I love these images, and the salad is so original. The flavors must be wonderful. i’m adding to your list of things with “c” – Cute G. so nice, this! the photos are stunning, and i was grinning at your words. This is so beautiful! I hope to have all the ingredients to make this next week from my CSA. I’ve already got the cherries… but I’m looking forward to farm fresh arugula. So artful! What kind of flowers did you garnish with? Goodness! Just when I didn’t think I could love cherries more. The pictures are spectacular and the salad is the type of lunch I could have every single day. Love your description of summer. Awesome pics and recipe. Would compliment your lamb recipe in your previous post for an after dinner salad. Cherries are in the fridge, Quinoa is in the pantry. Off to Farmer’s Market for the Arugula…. 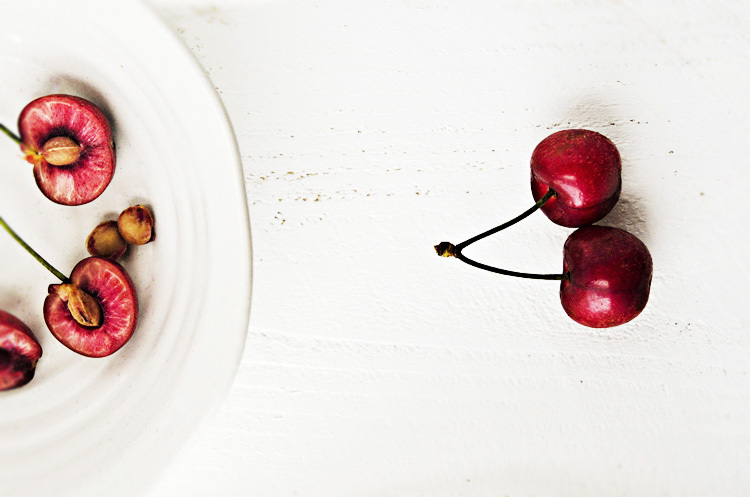 Did you know that fresh cherries can be used to treat gout. My husband suffered from gout several years ago from over consumption of very rich foods, and he is terrified of doctors, so the cherries was a real treat at the same time it help to ease the pain. He also drank tea brewed with celery seeds, and I also include some celery sticks in his diet for a quick cure. This seems inappropriate to post here, but I hope u don’t mind, as I like to use food as a cure for our ailments instead of medication. Gorgeous dish! 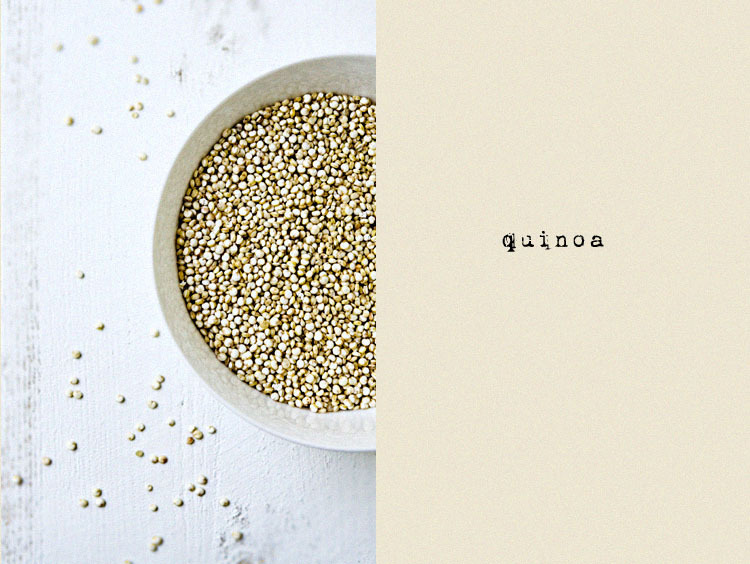 I adore quinoa, this is such an original and delicious combination! Sounds like such a delicious dish. As always, your pictures are stunning. I love the hue of the photos, the presentation–everything! on June 8, 2011 at 3:21 pm | Reply G.
Italianhandful – It’s my pleasure. Samantha Angela – I love fig jam too! In fact, it’s the one I use most when it comes to vinaigrettes. Homemade is best: http://kissmyspatula.com/2010/07/26/homemade-fig-jam/. So versatile. Tryityoumightlikeit – The flowers are clipped from the tops of the flowering portion of some mixed green baby lettuces in our ‘lil garden. Brian – Fabulous idea for the after dinner salad. Thanks so much for the love, everyone! xo. You take the most wonderful photographs. When you were gone for awhile I really missed your posts. Bravvissimo. Oh, wow, this is such a nice combination of ingredients. I’ve loved snacking on fresh cherries lately. This is a nice way to extend the love into a nice lunch or dinner. You mix all my favorite ingredients in one dish! Beautiful photos!! And defenetly I’m going to try the recipe. Oh my!! Your photo’s are stunning!! Quinoa is one of my favorite grains, and of course can never get enough of spring-fresh cherries. This sounds like it might be the perfect thing to whip up for a picnic I’m planning in the next week or two! Cherries are SO delicious right now! I love the idea of tossing them in my salad! 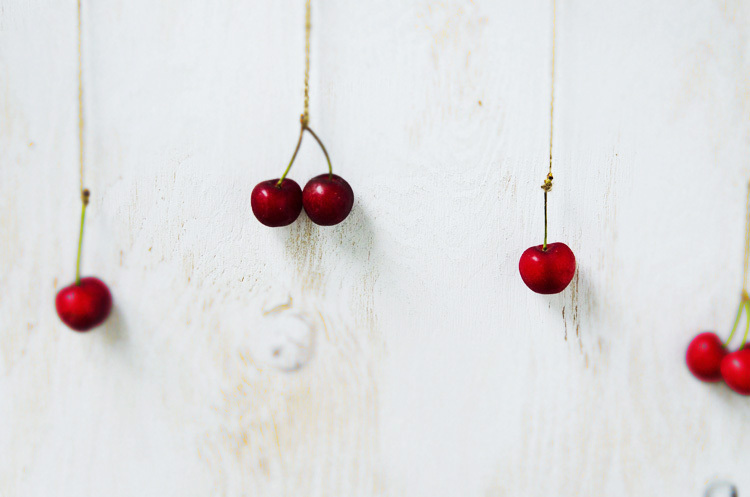 I am in love with cherries right now- they are so juicy and delicious! Combined with arugula and quinoa I can only imagine the dance they would do in my mouth! very different and unusual combination but so pretty! I love it! You have impeccable timing! Here I am with baby arugula and red quinoa at home, wanting to use both. I often cook quinoa with dried cherries, but I love the idea of this salad with the fresh ones. Beautiful recipe, thank you for posting it! Everything about this is lovely. LOVELY. You remember our long cherry seasons, right? I predict I will make this about 400 times over the course of this summer. Never will it look as beautiful or be photographed as well as here. Brilliant! I, too, have had an on-going love affair with cherries, and it’s so bad, they rarely make it into anything beyond my mouth. But arugula is a favorite — especially with fruit. The quinoa sounds heavenly with it. I absolutely adore this! So beautiful and simple! What splendid, simple salad that captures the beauty of the season! I always look forward to cherry season every year, I only wish it lasted longer. Oh my gosh we are on a psychic continuum! We are doing the exact same salad. Must be this Northern California air. Yours looks like perfection. 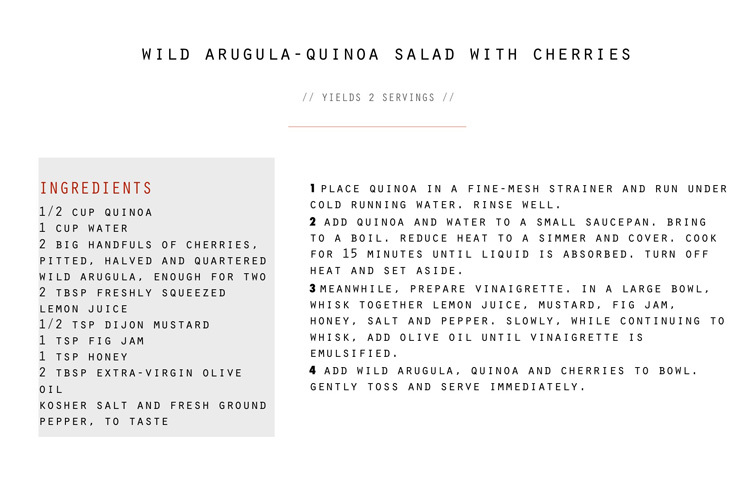 Love cherries, what a yummy sounding recipe, its hard to screw up quinoa, and the ingredients you put together. Great ideas to add the fig jam to the vinaigrette. We had smoked cherries last night with a pork loin. I am now anxious to break out my smoker and try some more smoked fruit. G. this is so lovely. I love the colors and your diptychs! As usual the composition of your photos are simply stunning! wow, this just looks fanastic – I am hungry just by looking at your pretty pictures! Soooooo good!! Beautiful photos as always. Cherries for us are a christmas time fruit, but I have spied some American ones beckoning to shoppers from the supermarket displays. Whispering tantilising words like… come on, you know I’m delicious! I’ve resisited, but will keep this recipe in mind for when the Australian ones come out again. I love the suspended cherries. You’re one of my favourite food blogs. I never thought of using cherries in a salad. I have to try it! As usual, everything so gorgeously photographed…I’m all about the cherries too – I was Skyping with F. yesterday and he said they harvested a whole lot of cherries 2 days after I left. The pain! I love your blog, you have such an amazing way of showing a recipe. So glad i came across it! Fresh cherries and sprouted quinoa waiting for me in the fridge and arugula in the garden! Cherries don’t last long in our house… so i’m not sure they’d make it long enough to get into this salad. But I do love the combination of ingredients here and I have no doubt that it is a wonderful pairing. once again, beautiful & such great wholesome ingredients. Would you ever consider providing a link by the recipes for a printable version of the recipes? lovely blog! 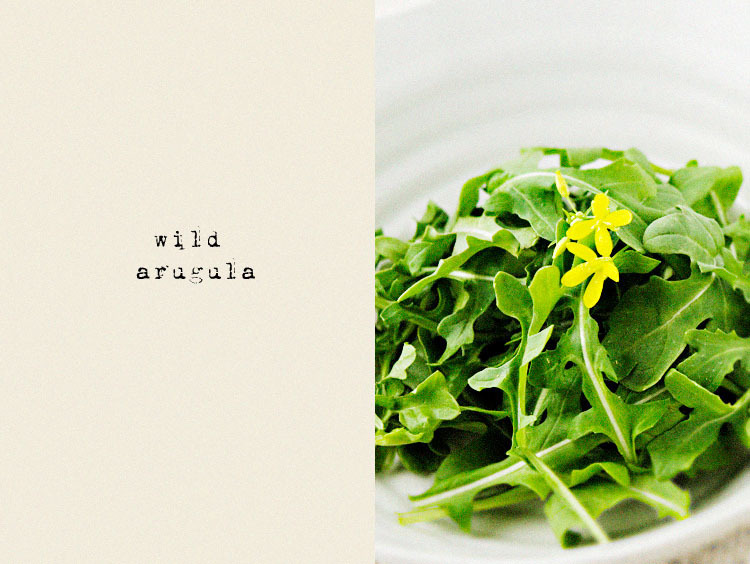 just wondering…what is “wild” arugula? The only arugula I’ve ever come across is at the farmer’s market or in plastic boxes at the supermarket…am I missing something? Can you actually stalk the wild arugula, much like wild watercress and asparagus? 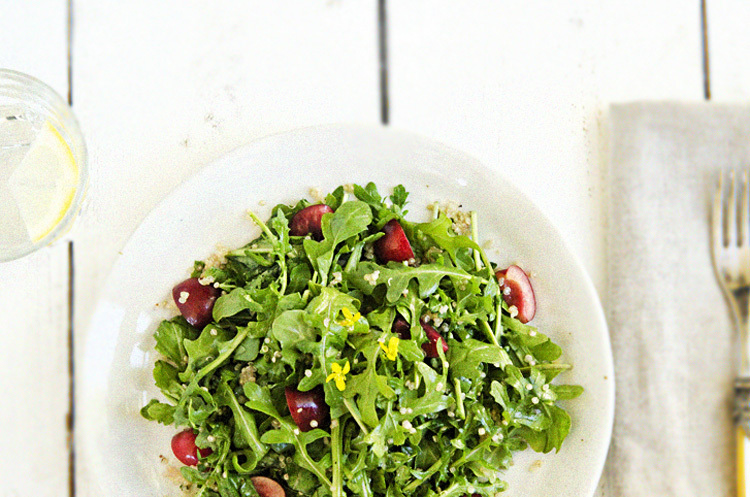 This recipe looks phenomenal, I love the idea of combining cherries and arugula, thanks!! Wow!! Your pics are amazing, so many lovely shots…and the food what can I say, delicious!